“Beart de réir Briathair” an téama a bheidh ag Tóstal na Gaeilge 2013, a thionólfar i mBaile Átha Cliatha ar Dé Sathairn, 16 Feabhra 2013 ó 9:30am – 5pm. San óstán Hilton (Béarla), Plás Charlemont, Baile Átha Cliath 2, a bhaileoidh pobal Gaeilge na tíre agus cairde na Gaeilge lena chéile ag Tóstal na Gaeilge chun plé a dhéanamh ar mhór nithe an lae i dtaobh na Gaeilge agus an tsochaí Gaelach. 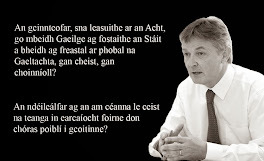 Tá clár cuimsitheach curtha le chéile ag lucht eagraithe an Tóstail, Comhdháil Náisiúnta na Gaeilge, agus ar maidin pléifear beartais an Rialtais i leith na Gaeilge. Díreoidh dhá phainéal éagsúla ar na beartais is déanaí atá curtha chun cinn ag an Rialtas faoi Acht na Gaeltachta 2012. “Ag Tógáil Clainne Trí Ghaeilge” a bheidh mar theideal ar an gcéad seisiún plé, áit a bpléifear na deacrachtaí agus na dúshláin a bhaineann leis an seachadadh teanga ó ghlúin go glúin laistigh den teaghlach. Faoi chathaoirleacht an iriseora Gormfhlaith Ní Thuairisg de chuid Raidió na Gaeltachta a bheidh an seisiún sin, agus orthu siúd a bheidh ag roinnt a dtuairimí ar an lá beidh: Feargal Ó Cuilinn, Ceannasaí Comhluadar; Dr Briain Ó Curnáin, saineolaí ar chanúineolaíocht agus socheolaíocht na Gaeilge le hInstitiúid Ard-Léinn Bhaile Átha Cliath; Aoife Ní Shéagha, Léachtóir sa Phleanáil Teanga le OÉ, Gaillimh; agus Sorcha Ní Chéilleachair, Cathaoirleach Thuismitheoirí na Gaeltachta – Conamara. “An Ghaeltacht in 2013” a bheidh faoi chaibidil sa dara seisiún faoi chathaoirleacht Rónán Mhic Con Iomaire, Leascheannaire RTÉ Raidió na Gaeltachta. Spreagfar neart plé faoin ábhar seo leis na haoichainteoirí: Seosamh Mac Donncha, OÉ Gaillimh, Stiofán Ó Cualáin, Údarás na Gaeltachta; Treasa Ní Mhainín, Eagraíocht na Scoileanna Gaeltachta; mar aon le hionadaí ón Roinn Ealaíon Oidhreachta agus Gaeltachta. Tar éis briseadh don lón reáchtálfar dhá sheisiún eile, áit a bpléifear “Tionchar Bheartais an Rialtais ar an nGaeilge” agus “Freagrachtaí na Stát i leith thodhchaí na teanga”. Beidh idir ionadaithe poiblí tofa agus ceannasaithe áisíneachtaí stáit i mbun díospóireachta, agus an plé sin faoi shúil ghéar Eimear Ní Chonaola, Nuacht TG4. 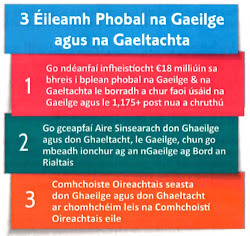 Fógrófar clár iomlán an Tóstail sna seachtainí beaga romhainn ar Gaelport agus beidh tuilleadh sonraí agus plé ar fáil ar na meáin shóisialta faoin haischlib #Tnag13.